Gateway to Language & Learning© is an efficient core word vocabulary offering user vocabularies for children, teens and adults. Unique to Proloquo2Go is Gateway’s new Child Functional vocabulary. This set is designed for children with Autism Spectrum Disorders who benefit from a functionally based core vocabulary. 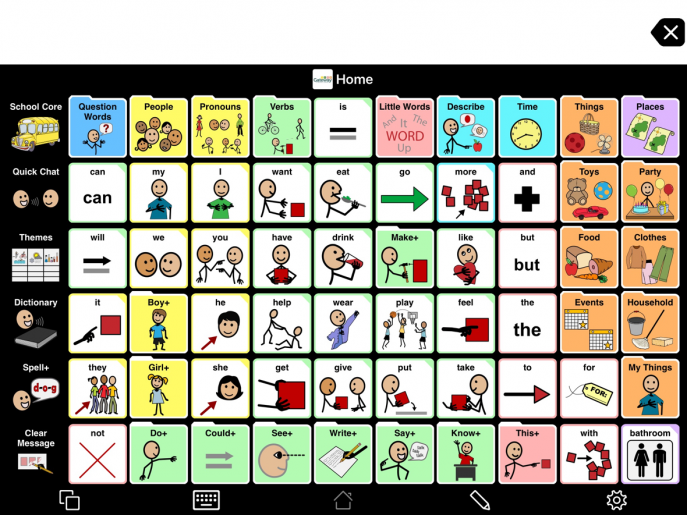 It facilitates communication at home and at school with dedicated core word pages and activities for social and educational settings. Different grid sizes are needed to match various user abilities. Gateway for Proloquo2Go offers an extensive array of grid configurations to support a wide range of physical needs and abilities. Grid sizes range from 3 x 4 (12 locations) to 10 x 14 (140 locations). Only Gateway for Proloquo2Go offers the 8 x 11, 9 x 12, and 10 x 14 grid sizes.